Dosage differs for 6+ year olds using a Bricanyl inhaler and 12+ year olds using a Symbicort inhaler. Watch the Asthma Australia inhaler technique videos to see if you are getting it right. Asthma is a medical condition affecting the airways, making it difficult to breathe normally. The severity of this condition depends on the individual, the factors causing the airway to narrow, and the triggers that set off or activate asthma symptoms or asthma attacks. ​*An asthma attack can range from mild to severe. The triggers that activate asthma symptoms and asthma attacks vary from person to person. Many people will find that physical activity or inhaling airborne particles like dust or wood fibres, can contribute to asthma flare-ups. 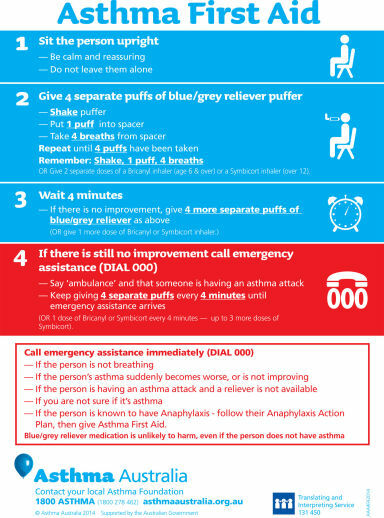 If you suspect that you may have asthma, then you should speak to your GP. Asthma is something that can develop at any time; some people will have asthma from a young age while others will be diagnosed later in life. It affects people of all ages. If you already know you have asthma, but you experience symptoms more frequently or more severely then you should consider an asthma review to help you manage your asthma. You may need a different dosage of any reliever or preventer medication you take, or you could be using your devices incorrectly. Appropriate asthma management will help minimise the impact it has on your life. If you experience asthma symptoms more than 2 times a week or you use your reliever puffer more than 3 times a week, then your asthma is not under control. Call us today to book a review or make an appointment to speak to one of our GPs about asthma. Our enhanced primary care team is there to provide you with the support and education you need to take control of your asthma. DID YOU KNOW: 1 in 10 Australians have asthma? Do you have the symptoms?